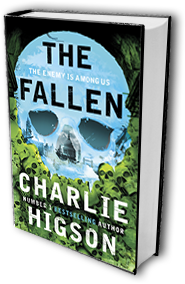 Penguin Books have joined with the BFI (British Film Institute) to launch a unique film making competition ahead of the release of The Fallen, the fifth book in Charlie Higson’s best-selling zombie series, The Enemy. Open to anyone of any age - whether they are fans of the books, budding film makers, or just huge zombie fans - the competition offers the chance to make the official trailer for The Fallen, published on 12 September 2013. Previous trailers for the series have had more than 100,000 combined viewings on YouTube and Charlie Higson has played a pivotal role in each of them. He starred in the first and wrote and directed the latest trailer which was the publisher’s most ambitious trailer for a book ever. Charlie Higson launches the competition with a twitter Q&A today, 22 May 2013, at 8pm BST. The deadline for entries is midnight on Friday 23 August. There are three categories in the competition: under 16s, 16-24s and 25 year-olds and over. Charlie Higson will choose a winner from each category alongside a judging panel from Penguin Books and the BFI. An overall winner will be chosen as the official trailer for The Fallen, and will be announced by Charlie at a Future Film event inspired by the BFI’s forthcoming Gothic season at BFI Southbank on Saturday 7 September. The overall winner will become the official trailer, but there will be prizes for all winning entries. The 16 – 24s winner wins a mentoring experience with IdeasTap and the winner of the over 25s category will have the chance to speak to industry specialists at the BFI Film Fund. Each category winner will get £350 vouchers for film making equipment, BFI Membership, signed copies of The Enemy series and a ticket to the BFI Future Film event on 7 September. The Enemy series is set in a post-apocalyptic London after a mystery illness attacks everyone over the age of fourteen. Some survive, but those that do face a more terrifying fate – they turn into hideous zombies with an insatiable appetite for human flesh. Children form gangs and attempt to survive in an unrecognisable world where there are dangers around every corner. Further details including information on how to enter and a brief story arc to be used as a narrative guideline, can be found at www.the-enemy.co.uk.